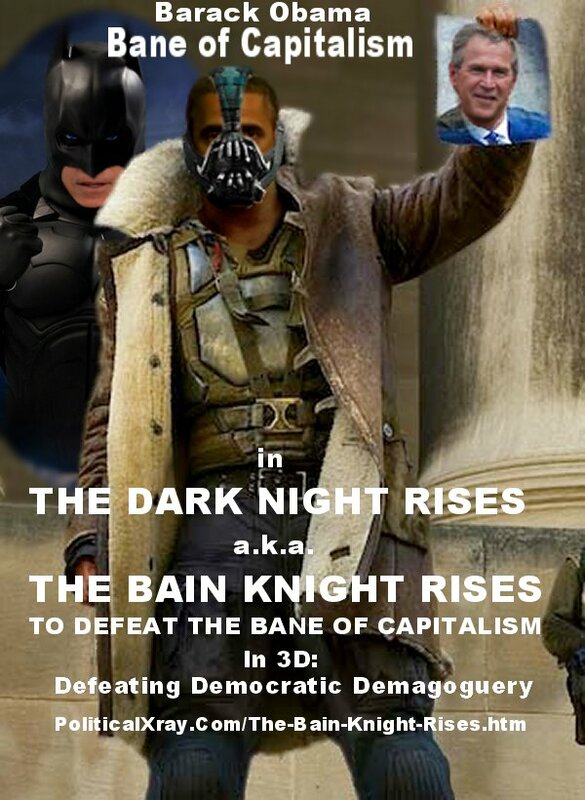 WEBCommentary(tm) - Mitt Romney is Bruce Wayne in The Dark Knight Rises to Battle the Bane of Capitalism a.k.a. 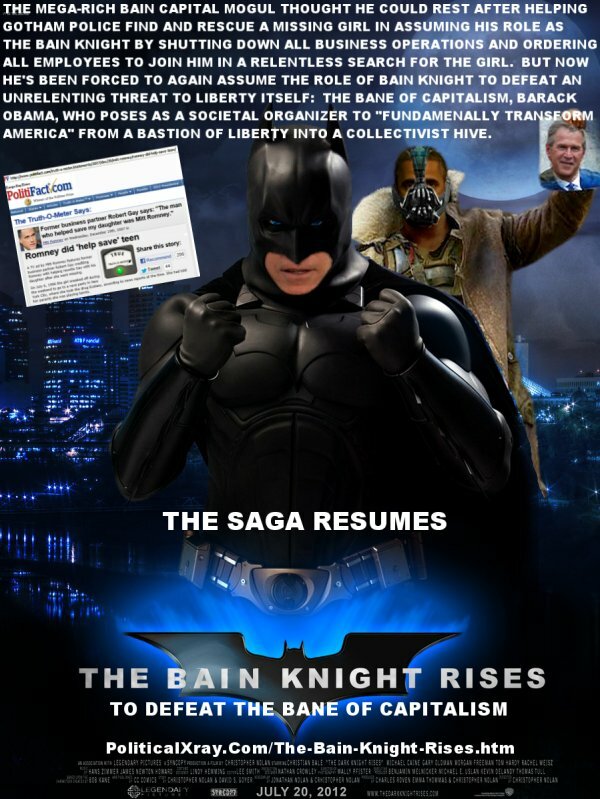 Barack Obama-- Bing, Google or Yahoo The-Bain-Knight-Rises. Mitt Romney is Bruce Wayne in The Dark Knight Rises to Battle the Bane of Capitalism a.k.a. 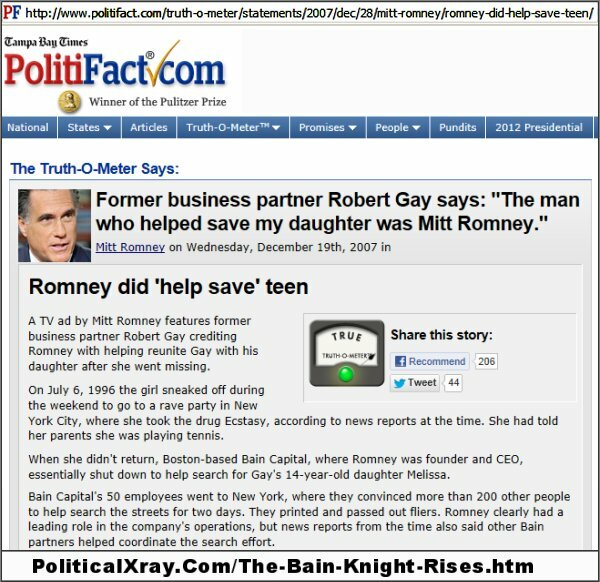 Barack Obama-- Bing, Google or Yahoo The-Bain-Knight-Rises. The Left loves to create false memes to defame or demonize conservatives. Their latest effort is to seek to trick the public into equating Mitt Romney, as CEO of Bain Capital, with the evil "Bane" character in "The Dark Knight Rises," but reality shows the public-spirited, mega-wealthy Bruce Wayne and his alter ego, the Dark Knight, as the character most resembling Romney and Obama's occupy-wall-street/class-warfare totalitarian, crony capitalism philosophy as being more akin to the Dark Knight's nemisis, "Bane." Will Romney rise to the occasion on November 6, 2012? That's the wrong question. The correct question is "Will the voters rise to the occasion on November 6, 2012?" Will 2012 be the year of the Liberty Voters Rising? Reality is frustrating the Collectivist efforts of Progressives, Occupy-Wall-Streeters, Barack Obama's 2012 Campaign, Leftist Entertainers, and the ever-loyal-to-Obama "Mainstream" Media to turn reality upside down by attempting to equate the evil "Bane" in "The Dark Knight Rises" with Mitt Romney as the former CEO of "Bain Capital," when the reality is that Mitt Romney, like the fictional mega-rich "Bruce Wayne," used the assets and resources of his vast business empire to help save a missing young girl. Psychiatrists call this phenomenom "projection" -- i.e., the tendency of a person with bad character traits to "project" them onto others and especially onto their adversaries. Thus, it seems clear that with respect to "The Dark Knight Rises," the character analogous to the mega-rich Bruce Wayne and his Dark Knight alter ego is Mitt Romney, and the character analogous to the destructive "Bane" is Barack Obama in his efforts to "fundamentally transform" America away from a liberty-driven capitalist system into a socialistic model.